Alloy Saw Blast Atmosphere Sintering Furnace Nitriding, oxynitriding, nitrocarburizing, austenitizing nitrocarburizing at low temperatures, superficial strengthening of thin-walled parts and steam can be performed on molds, knives or mechanical parts (including cast iron parts) Oxidation and mold nitriding heat treatment process is one of the most advanced heat treatment equipment. Alloy steel saw blade atmosphere sintering furnace pit controlled atmosphere nitriding furnace from the furnace, lining, lifting agencies, temperature control system, circulating fan, heating element and other components. 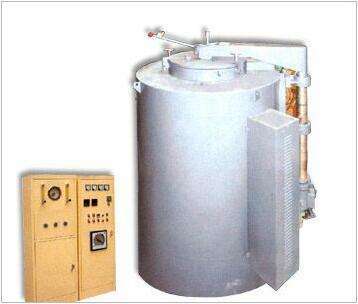 The heating structure is heated by a well-type resistance wire; the shell of the furnace is welded by a 4mm thick steel plate; the furnace body is a round type; the panel is made of 20mm thick steel plate; the welding seam is neat; the temperature- It is a high-efficiency energy-saving furnace made of masonry full-fiber formwork and aluminum silicate cotton. It raises temperature rapidly and the equipment is light in weight. It is filled with high-quality high-temperature cotton between the hearth and the furnace shell, saving energy on the basis of conventional heat treatment equipment. % Above, the lid lift mechanism using domestic production of electric push rod, easy to operate, trouble-free, lifting mechanism with upper and lower limit switch; furnace cover is equipped with high temperature sealed anticorrosive circulation fan, nitriding furnace stirring atmosphere, while the furnace atmosphere And furnace temperature to be satisfied with the uniformity; Furnace cover with exhaust pipe and pressure gauge, the furnace lid and furnace contact with water-cooled sleeve and vacuum seal, long-term use of trouble-free, so that the atmosphere will never be compromised, the use of Bottom gas, furnace temperature, furnace exhaust. Furnace atmosphere Circulating fan, the workpiece can be processed to achieve the desired state of the process. Furnace material is made of high temperature heat-resistant stainless steel 321, the thickness of 8mm. Heating element using OGr25Al5 U-shaped superalloy mounted on the lining of the lining. Furnace cover with a circulating fan, so that the furnace atmosphere and furnace temperature to be satisfied with the uniformity and improve the pressure inside the furnace, the furnace workpieces to achieve the desired effect of the process, exhaust excluded by the company specializing in the design and manufacture of exhaust gas combustion equipment inside the furnace Elimination of exhaust gas combustion, the workshop clean and odor-free, is the ideal choice for workshop environmental selection of nitrogen equipment.